The symptoms I experience, which tend to come and go, have included problems with balance, vision, co-ordination and fatigue, as well as loss of feeling in my hands and feet, stiffness in one hand and numbness down one side of my body. I have drawn upon the MS Trust many times for information so when the opportunity arose to give something back, I knew this was something I had to do. 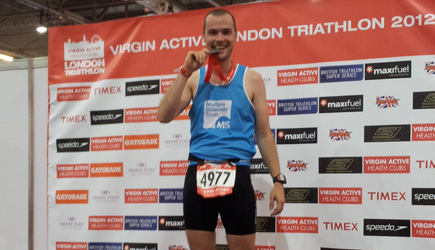 On 23 September 2012 I took part in the Virgin London Triathlon, swimming 1500m, biking 40km and running 10km. The training was hard but I did enjoy it. The motivation of doing it for the MS Trust made it easier. When I started I couldn't even swim a length and so I took lessons to prepare myself for swimming in the docks. Crossing the finish line drew a line under my diagnosis. It gave me a sense of relief and in a way allowed me to accept my MS but realise it's not the be all and end all. This has been one of the most challenging years of my life as I've adjusted to my diagnosis and the way my body has changed, but having this opportunity has meant that I've been able to focus on something positive and show to myself and others that this illness doesn't have to mean an end to our ambitions.